Customize the theme of your floor space with these interchangeable finials that attach and detach to the top of each countertop merchandiser effortlessly. The elegant curves of this S-shaped design create an influential air of sophistication throughout the atmosphere of your unique location. Our cobblestone collection features a hand-brushed copper of cinnamon color that is sure to warm any atmosphere. 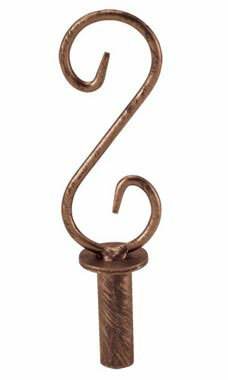 This finial works only on countertop merchandiser hook stands.